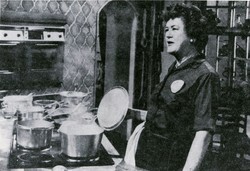 Julia Child didn't begin cooking until she was 32 years old and didn't begin her television career until she was 50. Her first book, Mastering the Art of French Cooking was published in 1961, and volume 2 published in 1970. The books have been republished as a two volume set and are still popular today. Her first TV show, "The French Chef," was one of the first cooking shows on American TV. It aired from 1963 to 1973 and Julia always ended each episode saying '"Bon appetit!" Julia Carolyn (McWilliams) Child was born August 15, 1912, in Pasadena, California. She attended Smith College and received a degree in English in 1934. Julia later met Paul Child while working for the OSS (Office of Strategic Services) during World War II. They married and moved to Paris after the war. Julia Child enrolled at Le Cordon Bleu Paris and earned the Diplôme de Cuisine in 1951. Mastering the Art of French Cooking, Vol. 1, was published in 1961, and Mastering the Art of French Cooking, Vol. 2, was published in 1970. These books are still in print, available in paperback. You can also buy a 2 Volume Set in hardback or paperback. The first show was aired in February, 1963, when Julia was 50 years old. The show was a success from the beginning and ran for ten years. She loved being a ham on television and her fans loved her. 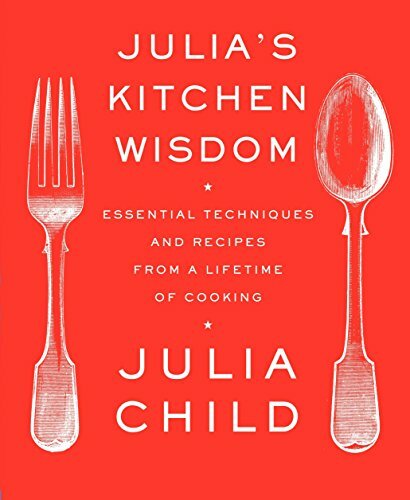 Throughout her career, Julia wrote more books and starred in other television cooking shows. She died on Aug. 13, 2004, two days before she would have been 92. A Poll ... Do You Enjoy Cooking? Yes, but only on special occasions. No, but that's because I don't know how. I'd like to learn to cook some day. "....no one is born a great cook, one learns by doing." "Until I discovered cooking, I was never really interested in anything." "One of the secrets, and pleasures, of cooking is to learn to correct something if it goes awry; and one of the lessons is to grin and bear it if it cannot be fixed." Julia Child’s kitchen is on display at the Smithsonian Institution, in Washington, D.C. This is her actual kitchen, not a replica. The kitchen was designed by Paul Child. He chose the light blue/green color scheme and added an extra 2 inches to the standard 36 inch tall countertops because of Julia’s 6′ 2′′ height. ~~ Julia and Jacques Cooking at Home with Jacques Pépin. Photo by Matthew Bisanz on Wikipedia. The Julia Child rose was bred by Tom Carruth in 2004. Julia Child personally chose the rose to be named after her. It’s called Absolutely Fabulous in the UK. How many minutes should you cook green beans? Julia Child gave us extensive answers to all these questions–and so many more–in the masterly books she published over the course of her career. But which one do you turn to for which solutions? Over the years Julia also developed some new approaches to old problems, using time-saving equipment and more readily available products. So where do you locate the latest findings? I hadn't heard of her here in UK until I saw the film. I found it very sad but funny and Meryl Streep was excellent. I watched the Julia Child cooking shows many years ago. The movie, Julie & Julia is a nice tribute in a way. happynutritionist - I hadn't heard abut that blog, but did a bit of research. Her name is Julie Powell and I couldn't find the blog. But she published a book based on it called, "Julie and Julia: My Year of Cooking Dangerously," which I found on Amazon. Personally, I like to cook but only when I want to. If I HAVE to cook, then it's a chore. I experiment a lot and only occasionally create a dud and have to throw it out. I can usually salvage a dish even if I have to later add more to it. How Do You Make Sugarplums? Most of us associate sugarplums with Christmas, either with "The Night Before Christmas" poem or with the "Nutcracker Ballet."